As the goddess of flowers, lightlv clad in a sleeveless white gown, Vigee Le Brun's nineteen-year-old daughter strides across the landscape, a long red veil draped over her left shoulder and swelling in the breeze. The sources of some of the artiscs more neoclassical compositions were the wall paintings bf dancing maidens in the so-called Villa of Cicero at Pompeii which she had visited while residing in Naples and which were engraved in Le antichita di Ercolano. Long swaths of drapery fluttering in the wind was a motif common to many of these antique decorations. The portrait was executed in Saint Petersburg shortly before Julie's marriage to Gaetan Bernard Nigris. 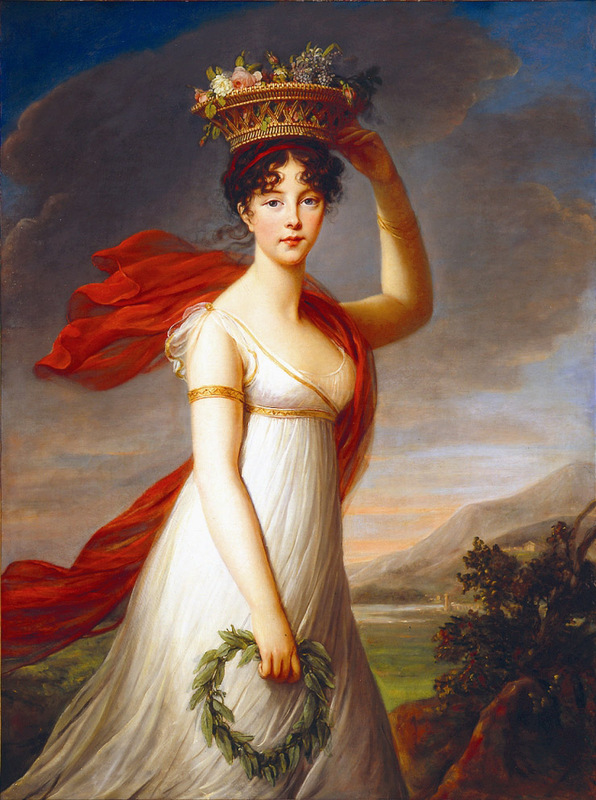 It can be dated on the basis of its relationship to the portrait of Princess Eudocia Ivanovna Galitzin as Flora, a work signed and dated 1799 (illus. in Nikolenko, 1967, p. 111; formerly in the Stroganoff collection and more recently with the Hirschl and Adler Gallery, New York). It is probably the portrait of the artist s daughter which, when shown as no. 255 at the Taurida Palace exhibition of 1905, was in the Klotchkoff collection. No. 254 of the same exhibition was the Galitzin Flora. PROVENANCE: (?) Capitoline Semenovna Klotchkoff collection, Moscow, by 1905; Charles Brunner, Paris, ca. 1928; Schwob d'Hericourt collection, France, until 1979. REFERENCES: (?) Helm, [19151, p. 213; L'Art et les Artistes, VL February 1923, illus. facing p. 172; Nikolenko, 1967, pp. 92, 111, cited under no. 36 (author mistakenly assumes that painting is a second version of the portrait of Princess Galitzin, cited above). EXHIBITIONS: (?) Saint Petersburg, Taurida Palace, Artistic and Historical Exhibition of Russian Portraits, 1905, no. 255; London, Wildenstein, Consulat, Empire, Restoration: Art in Early XIX Century France, June 17-july 27, 1981, no number, illus. p. 43 (as Portrait of an Unknown Woman); New York, Wildenstein, Consulat-Empire- Restauration: Art in Early XIX Century France, April 21-May 28, 1982, p. 125, illus. p. 54.